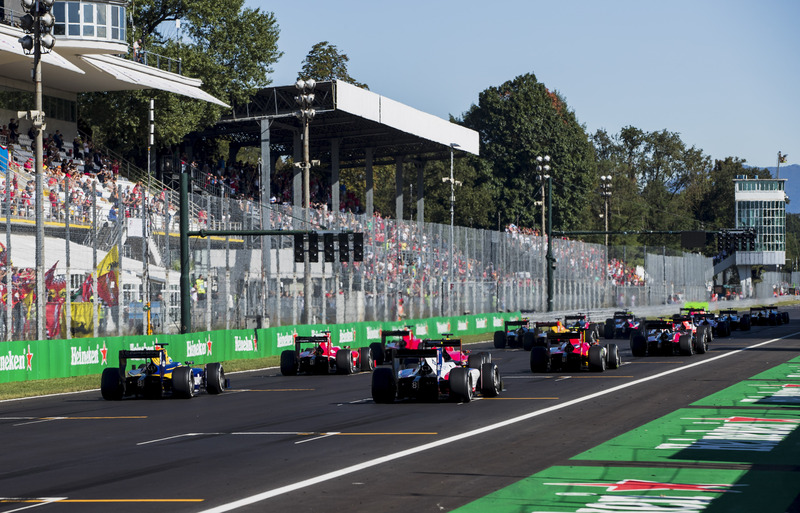 Formula 2’s visit to Italy threw up more than a few surprises over the course of the weekend, with a frenetic set of races that saw us leave Monza with the gap between first and second in the championship somehow still at fifty-nine points. Charles Leclerc’s on track pole position streak finally came to an end when ART’s Nobuharu Matsushita posted the fastest time in a disrupted session on Friday afternoon, while the championship leader sat all the way down in seventh place. It was a mighty recovery for the Japanese driver, who crashed out of the last race in Spa in spectacular style. It also meant that it was something of a shaken up grid that started Saturday’s feature race, with none of the championship front runners even on the front row. On Saturday it wasn’t even a simple case of the drivers turning up and racing. 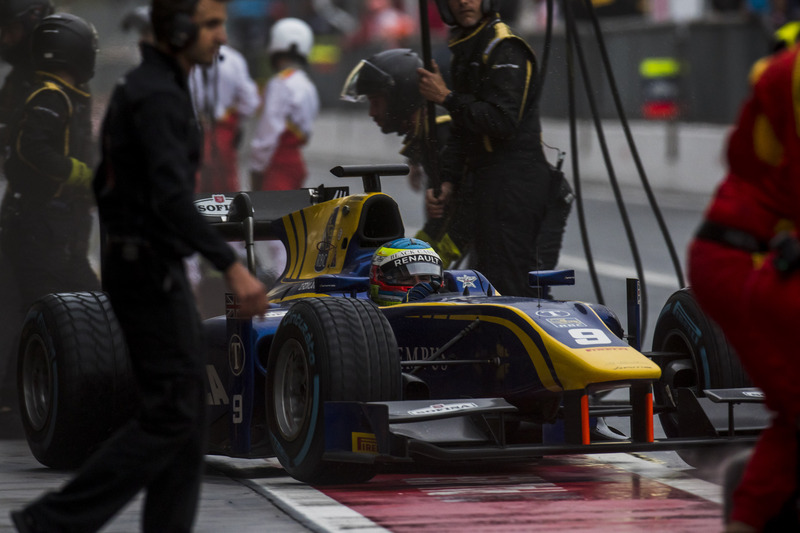 Thanks to the torrential downpour that led to the cancellation of the GP3 race and the long delay in Formula 1 qualifying, the Formula 2 feature race started around two hours late. 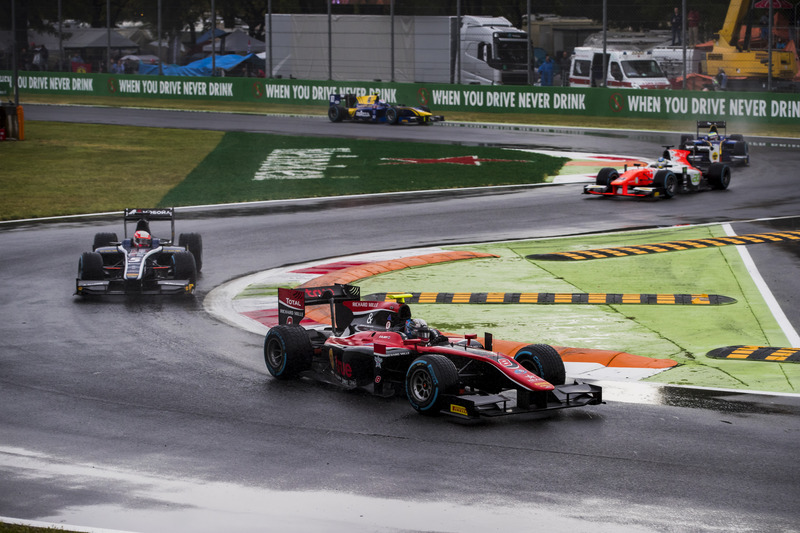 The wet conditions also led to the field circulating behind the safety car for six laps, with an extra formation lap added when Santino Ferrucci stalled just as the race was finally about to get underway. As expected, given the conditions, it was a messy start with contact between the leading cars at the first corner, but Racing Engineering’s Nyck de Vries managed to take the lead from Matsushita. After his disappointing qualifying, Leclerc improved almost immediately to third and into the podium places, which much of the field scrapping behind him as the cars battled through the wet tarmac, a fight saw ART’s Alexander Albon spin and end up at the back of the field. Poor visibility from the fountains of spray being kicked up by the cars didn’t stop Leclerc taking second from Matsushita around the final corner of the track. But it was his fellow championship contender, Oliver Rowland, who made up the most amount of places in the opening laps, improving to fifth from thirteenth on the grid by the end of lap 3. Quickly, Leclerc was gaining on de Vries, circulating comfortably quicker than the McLaren junior as all the drivers learnt how to navigate the difficult conditions. Rowland looked imperiously quick as he moved off the racing line to overtake the experienced Roberto Merhi, moving past Matsuhita barely a lap later. This was a tactic many of the other drivers began to emulate in a bid to find more grip and speed. De Vries managed to keep a cool head under the pressure being mounted on him by Leclerc, showing that his new stint at Racing Engineering is a far more better fit for him. The majority of the top ten waited until a few laps from the end to pit, with Leclerc making his stop on lap 18 of 23, with de Vries and Rowland coming in a lap later and both of them managing to maintain position. But the race was by no means decided then, Leclerc wasn’t giving up the chase and disaster struck Rowland on lap 19 when one of his tyres came loose, ending what would have been a truly storming race for the British driver. His abandoned DAMS brought out the safety car with just a handful of laps remaining. Racing resumed on lap 21 with a lightning fast restart from the leader de Vries and Leclerc, who pulled away from the now third placed Luca Ghiotto. A mistake by Leclerc at the first corner forced him to cut the chicane and subsequently give the position he gained, which opened the door for Ghiotto who flew into the lead of his home race with only a lap and a half to go. De Vries fought back aggressively with the two cars running side by side down the start/finish straight as they started the final lap of the race. An error under breaking from Ghiotto saw him cut the first chicane but crucially maintain the lead – a mistake that would come back to haunt him later. Meanwhile Leclerc tried to make the pass on de Vries, narrowly avoiding a collision with Matsushita, only to be forced wide and off the track by the Dutchman. The clumsy move saw Leclerc finish last and de Vries retire with a puncture from the contact. De Vries would later be penalised for the move but the time penalty made little difference to Leclerc and Prema, who were understandably furious about the incident. It wasn’t all disappointment for Prema however, as their other driver Antonio Fuoco fought his way through to second, making it an Italian 1-2 at Monza, and securing his third podium of the season. ART’s Nobuharu Matsushita finished in third, making up for his poor start from pole, with Nicholas Latifi coming in an impressive fourth place after starting fourteenth. Alexander Albon, who was running dead last on the first lap was another driver who made a strong recovery to finish fifth, followed by Sean Gelael, Sergio Sette Camara and Louis Deletraz in eighth with his best finish of the season so far. 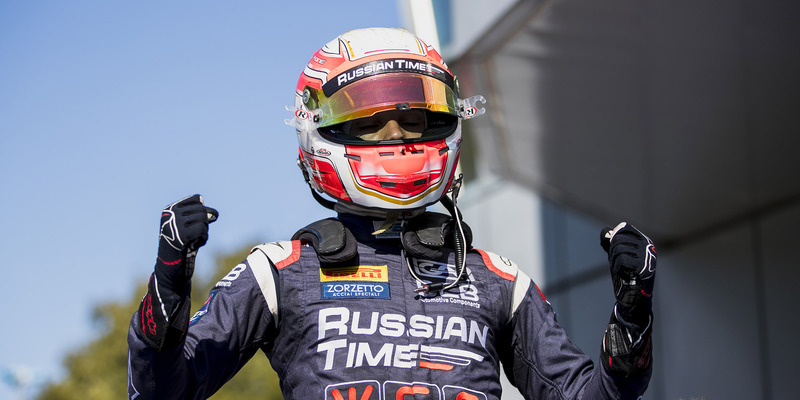 Gustav Malja and Artem Markelov picked up the final points of the race. But it wasn’t all over yet. In a déjà vu moment similar to the events of Spa one week ago, late into Saturday night it was announced that race winner and home hero Luca Ghiotto had been handed a five second time penalty, stripping him of his victory, and pushing him off the podium entirely, making his final finishing position fourth place. It meant his countryman and Prema driver, Antonio Fuoco collected his first race win of the season, and whose performance proved that his early bad run was not indicative of his talents. Nobuharu Matsushita, therefore, received second place, whilst Nicholas Latifi moved onto the podium to take third. 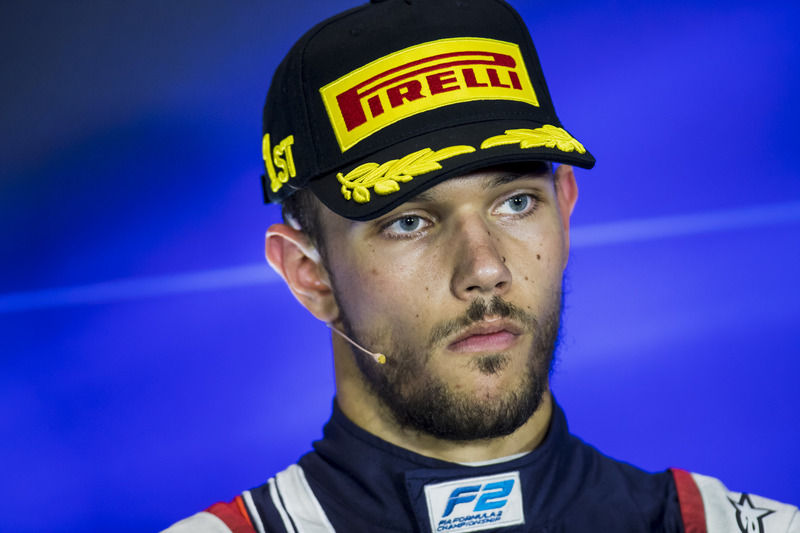 Alexander Albon, who had finished fifth on track was also given a ten second time penalty for his collision with Norman Nato, which demoted him from the points and into fourteenth place. The last lap drama of Saturday’s race saw the grid for the sprint race look a little different than we might expect. Without the treacherous conditions of Saturday, Sean Gelael and Louis Deletraz were able to get flying starts, overtaking the reverse grid pole sitter Gustav Malja. The Indonesian driver managed to fight his way into the lead; unfamiliar territory for the Arden driver who is yet to finish higher than fifth place this season. The sprint race was all about recovery for Rowland and Leclerc, who started near the back of the field and set about trying to cut their way through the field. But they weren’t the only drivers who had a point to prove. Ghiotto was vocal about how disappointed he was to lose his first race win of the season, and was clearly determined to make amends on Sunday. Most of the field were bunched together, with the drivers in the podium positions constantly swapping and changing in the first few laps, as Gelael lost his lead to Deletraz and began to slip down the order. Within just seven laps, Ghiotto was back in the podium positions with an uncompromising couple of moves on Gelael and Sette Camara. Monza is a track renowned for generating massive slipstreams, which, while aiding overtaking, leaves advancing drivers vulnerable to attack from behind. Rapax’s Louis Deletraz learnt this the hard way as he fought to keep the lead from the charging Luca Ghiotto, which he eventually lost on lap 11. Ghiotto was being followed by Sette Camara, but it would be hard to deny the Italian driver the race win which had been taken away from him the day before. The young Brazilian was driving well to prove that his sprint race win in Belgium was not just a case of good fortune, but raw speed and ability. The close running made a collision seem inevitable, and many of the drivers did pick up damage over the course of the race, including Leclerc, who had worked his way up to ninth but struggled to make it much further with a broken front wing. Antonio Fuoco was on a mission to secure his first double podium of the season, his speed showing just how confident he is around Monza, especially as he overtook Deletraz with ease for third place. Luca Ghiotto’s dominant race win was never in doubt this time, and the Italian could feel vindicated that he had driven out of his skin to secure a victory he believed he deserved. It was a mature drive from Sette Camara to take second place, and a strong showing from Fuoco to take third, pleasing the crowd of fans who were cheering on the Ferrari junior driver at Monza. Louis Deletraz’s fourth place was his best finish of the season, and rounded off a much stronger weekend for the Swiss driver, who had floundered a little up until this point. Roberto Merhi, Sean Gelael, Matsushita and Alexander Albon – who made a good recovery from fourteenth on the grid – occupied the final points paying positions, while the championship leaders Leclerc, Rowland and Markelov all finished empty handed. 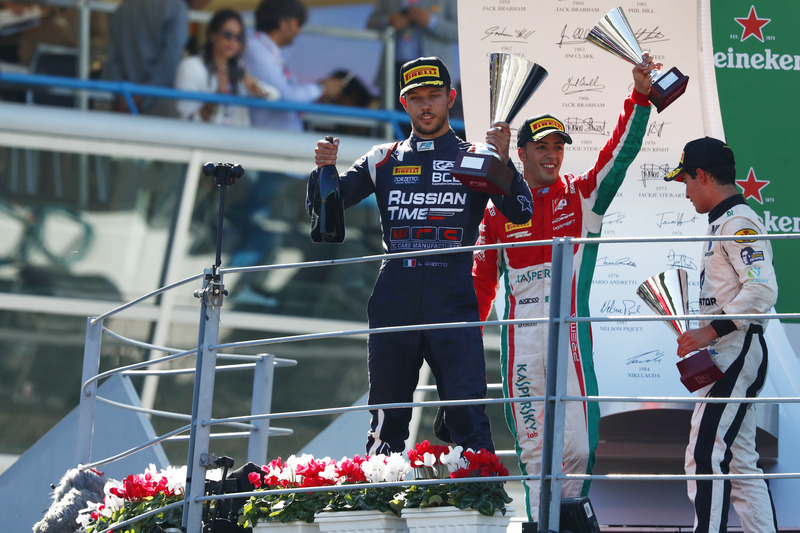 The Italians were undoubtedly the stars of the weekend, and whether it was a case of home turf advantage, both Ghiotto and Fuoco proved that they shouldn’t be overlooked in favour of their teammates. Ghiotto’s performance, including a much needed first race win, has placed him in the picture of the championship fight, as he is now only two points behind his teammate Markelov, and just nine behind Rowland. The main fight in the driver standings remains unchanged, with Leclerc and Rowland feeling the brunt of bad luck once again and failing to score at all. With his fifty-nine-point lead, if Leclerc can steer clear of trouble in Jerez in a month’s time, then it is possible that he could wrap up the championship in Spain. But the drama and unpredictability of the season so far means that as likely as this might seem, it is far from guaranteed.